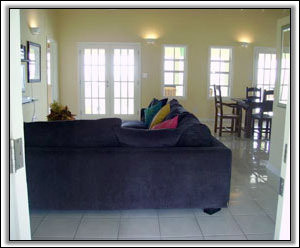 Channel Villa - Nevis, West Indies. Great views and great for the kids. In a newly developed area of Jones Estate, the Channel View Villa property has an electronic gate at your drive entrance. The large spacious grounds allow a safe area for children to play. 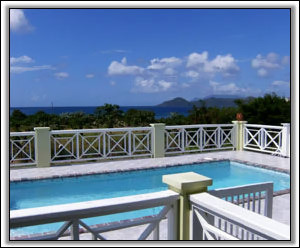 The views allow leisurely afternoons watching the activity on the water or just catching the rays on the pool deck. The large main living area, which opens to the veranda, includes a siting area with comfortable sofas for flat screen TV viewing, indoor dining area and pass through, fully equipped kitchen, with fridge/freezer, oven and microwave. The master bedroom has direct access to the veranda. 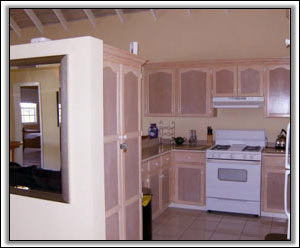 Washer and dryer are part of this fully furnished villa. 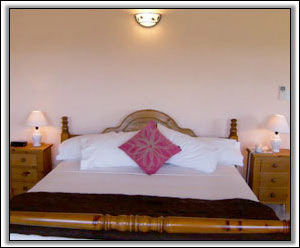 Master bedroom - king size bed with en-suite bath and direct access to veranda. 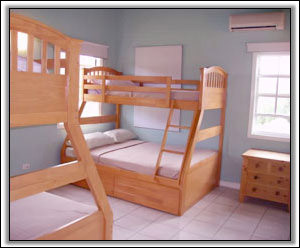 Third bedroom - two sets of bunk beds with ensuite bath. Within a ½ mile radius, there are several restaurants providing a varied selection of cuisine and ambiance. "Oualie Beach Hotel" International and Caribbean cuisine. "Miss Junes" Creole Caribbean cuisine. 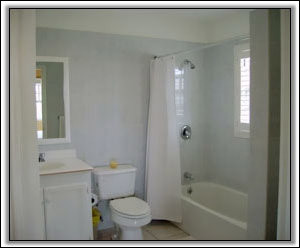 The master bedroom has direct access to the verandah.